In ViSit Anywhere version 6.3 we have updated the underlying SharePoint client in order to facilitate connecting to SharePoint. Using this client we will also be able to add new and powerful tools to the SharePoint functionality offered by ViSit Anywhere. Note, that this version of ViSit Anywhere will require Windows 7 or greater (we recommend using Windows 10). 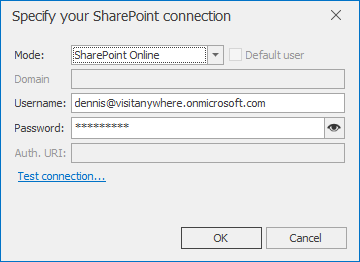 In this version of ViSit Anywhere we have unified the connection to SharePoint in one simple connection control (shown below). In order to connect to SharePoint, it is now necessary to use this control (at least one time). Once the user has successfully connected to SharePoint, the credentials are safely stored for future use. A typical usage of this dialog, will be to test the connection defined in a ViSit Anywhere schema object (shown in the image below). Note, that we have provided the URL of a SharePoint Online connection and unlike previous versions of the connection tool, no environment variables are required. The user specifies the connection type directly in the connection dialog (see the Mode field above), where SharePoint Online has been selected. SharePoint Online does not require a domain and can not use a default or anonymous user, so the user name and password must be provided. Other connection modes have other criteria. The image below shows the possible connection modes. Note that the SharePoint server must be configured to accept the selected configuration mode. Most of our projects will use either Windows Authentication or SharePoint Online. Some SharePoint servers allow anonymous access. If this is the case, the user should be able to connect to SharePoint by selecting this option. As the name suggests, this allows anonymous access and a user name and password are not required. Some SharePoint service may be configured to use HTTP forms authentication. This is typically used by organizations that allow web access from users not in their Windows domain. The users generally have to provide a user name and password. Some installations use a special purpose authorization endpoint, and thus it is possible to provide the Auth. URL in this case. This form of authentication is specific to connecting to SharePoint Online using a standard Microsoft Office 365 user. This is not generally available for SharePoint on-premises. This type of authentication uses standard Windows logins. In this case, if the user select Default User, the current Windows user credentials will be used (an no other credentials are required). It is possible to provide a different user by not checking the Default User box and providing a domain, user name and password. The new SharePoint client is also used in the SharePoint based ViSit Anywhere Business (VAB) snap-in. In this case, the new client controls the interaction between the SharePoint workflows and the ViSit Anywhere application. Again, the user must provide the connection credentials at least one time. After this the credentials will be cached for future use. In this case, the user simply clicks on the standard VAB control to connect to the Jobs server (Workflow >> Connect) - as shown in the image below. If the user has not specified the connection credentials, clicking on this button will cause the connection dialog (shown above) to open. Again, once the connection has been established at least one time, they are safely cached on the user's machine. In ViSit Anywhere version 16.3 we have improved the usability and stability of the interaction between our application and SharePoint. When first connecting to SharePoint, the user is presented with a unified connection dialog. The user simply selects the type of authentication to use with his SharePoint server, provides the login credentials and ViSit Anywhere manages the rest. The credentials are safely cached on the local machine to ensure that users do not have to re-provide them with each visit. The new SharePoint client also provides us with advanced SharePoint related features that we hope to introduce in the near future.